Photo Credit: Craig McDean for Interview. I am spending this week wearing Hawaiian shirts. Because of, you know, that little project of mine. But really, I aspire to go minimal. 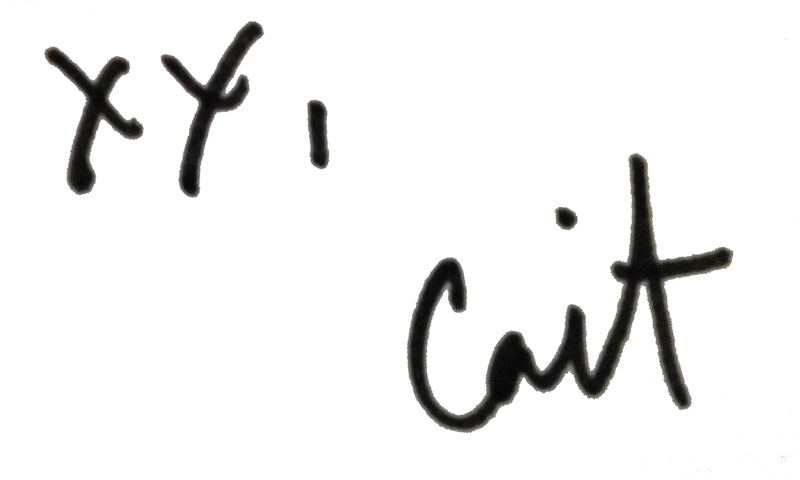 Cait’s totally mastered this. Minimal for me, usually means, stripes? But ever since these gorgeous trousers came out, I’ve had an end goal in mind. 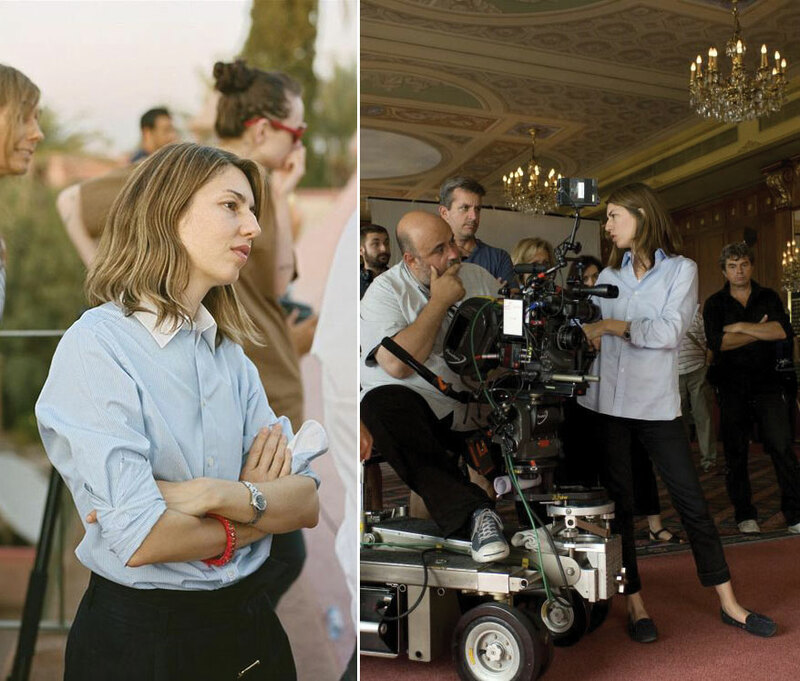 Sofia Coppola is a person who is the queen of the effortless, minimal chic. I was 15 when The Virgin Suicides came out and she became the woman I wanted to be. All that ethereal lighting in her films! Then I turned 18, got rid of the skater boy clothes and noticed what she wore. She gets menswear. Yet the dresses she wears always convey a sense of girl-ish femininity. She also gets wearing just greys, blacks and whites. Only. Maybe some blues are thrown in there. She was freaking Marc Jacobs’ muse in his early days, and a style icon of the 90s in her own rite. 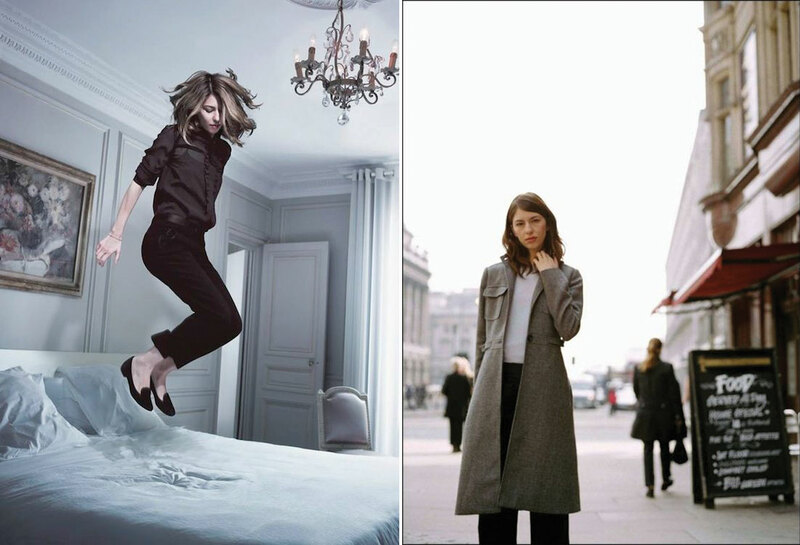 She was married to Spike Jonze and is now with Thomas Mars. Both pair with her like the Stan Smiths on her feet. Yes I just compared her men to accessories. I don’t even know why I mentioned the men in her life because her work completely stands on its own. She’s always seemed like the cool girl that I could get to be. Accessible. Attainable. You can even see bits of her in the female protagonists that dominate her films. Make up is always minimal. The lines are always clean. There is an indelible sense of her in Elle Fanning, Scarlett Johansson and Kirsten Dunst through them all. It’s uniform by diffusion. And as she’s grown up since The Virgin Suicides, that aesthetic has persisted. And it’s clearly genetic since her niece Gia collaborated with equally clean minimal brand, Everlane, this past year. So while I’m still going to have the pops of colour somewhere. I can’t wait to find that perfect pair of black trousers that barely skim my ankles and where them all the freaking time. But that men’s shirt on top will be totally tiki in its print. 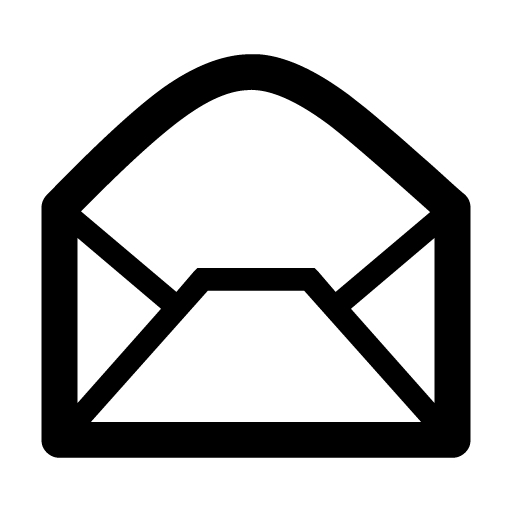 Categories: by tiff, iconography | Permalink. She’s always been at the top of her game, but then she blew the roof off this past weekend when she released Lemonade on HBO. 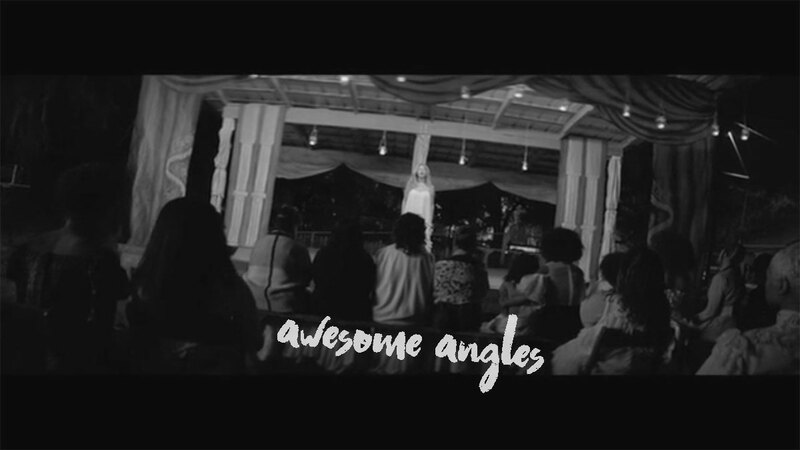 Everyone bow down at the temple of the Bey. 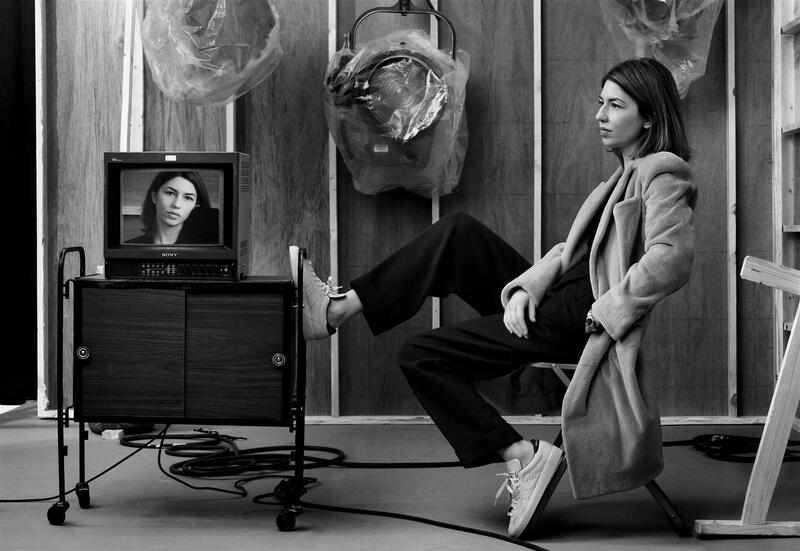 Those visuals that juxtapose harsh urban and soft historical with a whole neo-gothic feel all about, seamless poetic interludes, Super8 shots!, and the power of and beauty and diversity of all the women she features throughout (read more about the production here). Moments of sheer delight next to deep darkness. 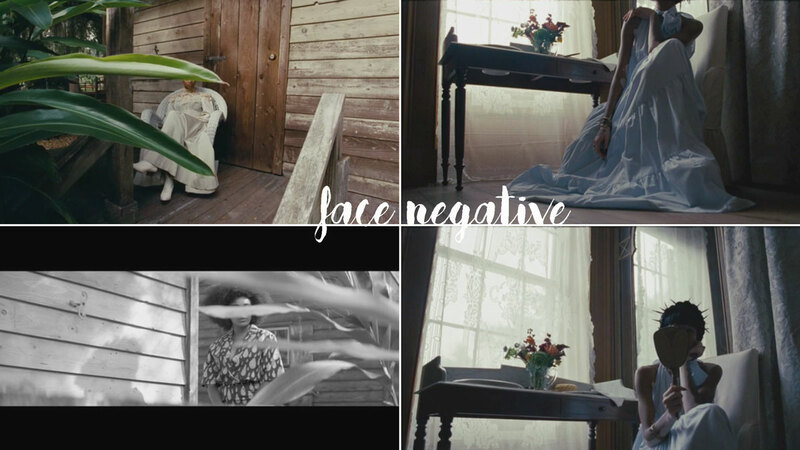 Primacy on the experience of the black woman across generations and ethnicities from French Yoruba (Ibeyi) to Jamaican Canadian (Winnie Harlow). The subversive social commentary. There is an interconnectedness between each and every image no matter how starkly distinct they are. I was blown away and so inspired. There are very few longform visual pieces that I find myself feeling this way for. 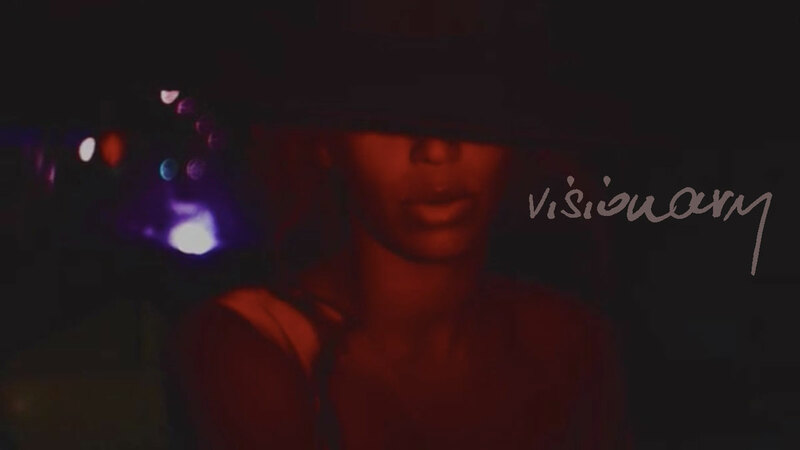 So after more than a few viewings, I wanted to showcase some of the profound cinematography Beyoncé and her team created for this evocative visual album. 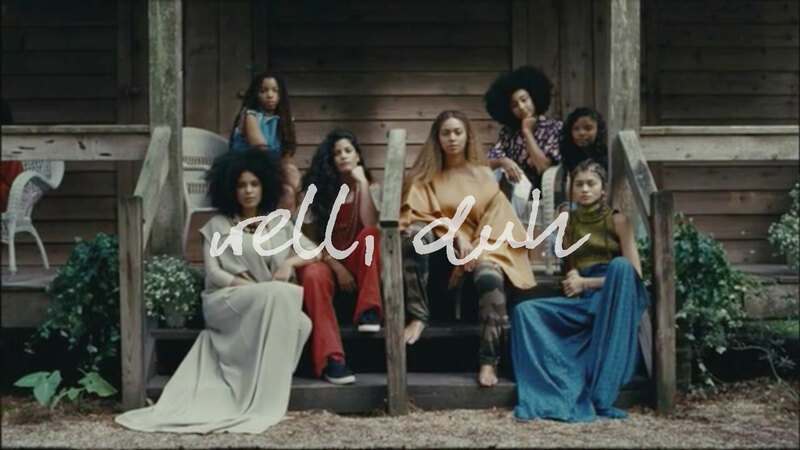 Beyoncé has officially taken the music video medium through the sky and beyond. If you haven’t watched it yet, you can watch the whole thing here for free. 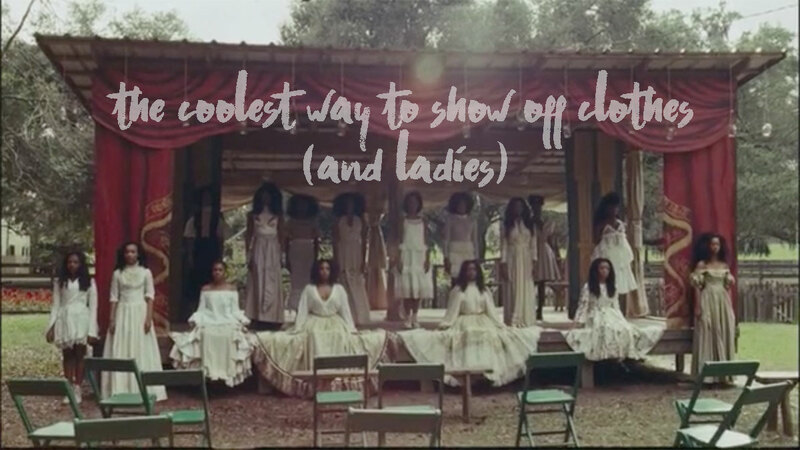 PS – Lemonade was totally on repeat through producing this post. It’s a legit good album. If you don’t believe me, at least listen to the hipster music gods. I’m pocketing this for a lookbook! I’m feeling completely justified for hiding some of my models behind plants and certain framing decisions I’ve made in past shoots. 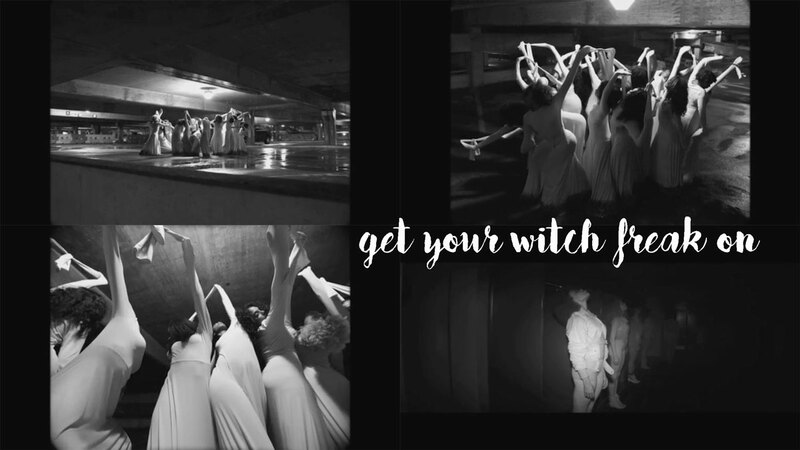 Have you watched The Witch yet? Now mash that up with some early Missy Elliot. You know which one I mean. All the ladies. So much power in this shot. I’m doing a ton of portraits these days, but I’m keen to get outside the box of traditional angles and frames. My fave is the one on the upper left. Now that is genius. All the fonts! Kuba Reczny, Bakery, Asphalts and Haze. 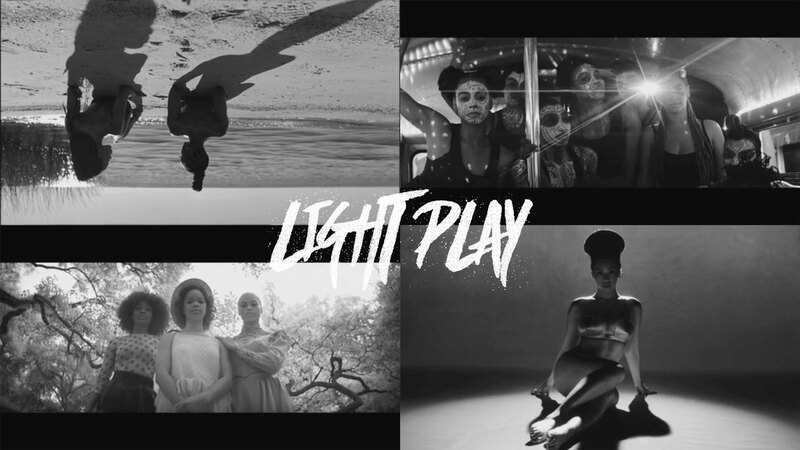 Categories: iconography, prettyshit | Tags: beyonce, cinematography, Lemonade, Lemonade screen shots, Lemonade visuals | Permalink. 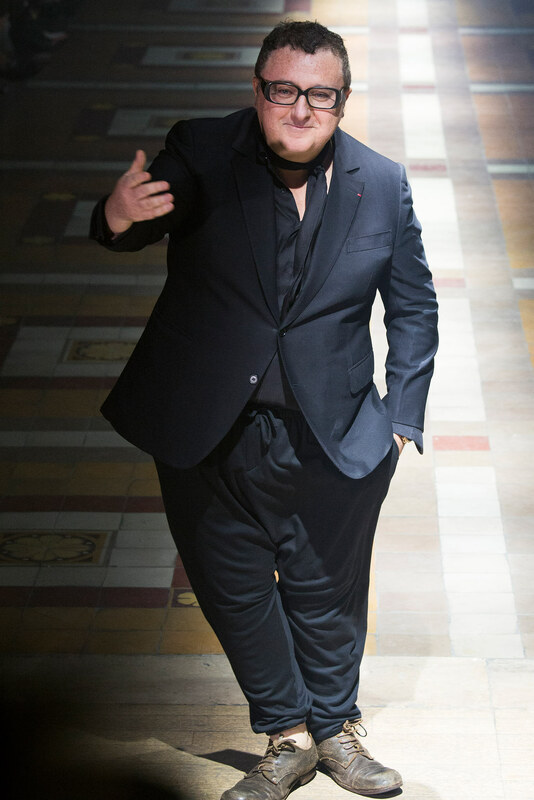 I saw Alber Elbaz walking on the Seine when I was in Paris a few months ago. He was wearing all black, had his glasses on, and was unmistakably…him. I stopped and just sort of slowly turned around with my dumb mouth open, as he walked passed me and my parents. He was in a hurry, and probably didn’t recognize me. I giggled the rest of the day. Yesterday, after 14 years as the lead designer/creative director for the iconic French designer, Lanvin, Alber Elbaz has been dismissed. I’m not a fashion critic, and I can’t claim to understand the inner-workings of the industry. It’s a gigantic, complicated beast and the details of what exactly happened aren’t exactly public information. But from what I can tell, this is pretty messed up. Elbaz seems like one of the good ones to me, and I have always followed his work. I confess that I often forge imaginary relationships with people I admire, and in the same way that I feel like I would be really good friends with Kristen Wiig, I think Elbaz and I could really vibe. However it went down, it’s a damn shame. Elbaz created some of the most elegant, interesting, and innovative designs I have seen, and he’s been a constant force of inspiration in my life. In his time at Lanvin, he was dedicated to making clothes for actual women, and not just the size zeros of the world. He wanted to make fashion accessible without compromising taste and quality. He pumped new creative life into a brand running on fumes and brought Lanvin back into the mainstream with collaborations and humor. Maybe most importantly, he was kind. He would often send other designers flowers before their shows, and was constantly grateful for his life as a designer. There many people who can write better than I can about this lovely man, and Sarah Mower, who I really respect, wrote a great piece for Vogue Runway. She has known him through his tenure at Lanvin, and it’s worth a read. I am sure he will go on to do more in the fashion world and he doesn’t honestly need a house like Lanvin to back him. He’ll be just fine. Have some wine, sleep in, and plot your next amazing thing, sweet man. I can’t wait to see what you do. Categories: albert elbaz, Cool Kids, iconography, makers, prettyshit, process, thefeels | Tags: alber elbaz, Lanvin | Permalink. Warning: Some of the links embedded in this post lead to NSFW +18 content. Viewers beware! Also, yes I’m a big weirdo. As peeps who have decided to take a complete turn on their careers and a veer into the creative, we are often asked “what inspires you?” On one hand, because the world is our oyster and we’re only just stepping into things, the answer is everything. And you see this on the blog. We are experimenting and learning from everything and everyone. For me, on the photography, layout and content side, there is the food, the fashion, the travel and really cute pictures of toddlers that I’ve been taking for friends. I love that stuff. On the other hand and under the surface, I’m also still trying to define and evolve towards a personal style. Of course this takes time, time and a focus to take risks. And learning. A Beautiful Mess even devotes an entire lesson to it. And at the end of the day, time spent on focusing what inspires me. This usually involves creating a pin board. And in doing so, it all brought me back to my love for Vice Magazine. Can I count the ways? I still remember being fifteen years old, looking for some way to define myself and rebel against the norm. I loved counter culture. I spent most Fridays after school in the at-the-time slightly grittier Queen Street West area in Toronto mulling about with friends who loved the alternative. One day, I wandered into Vice Magazine’s little outpost (yes they’re Canadian!) they had there back then and a lifelong relationship was born. 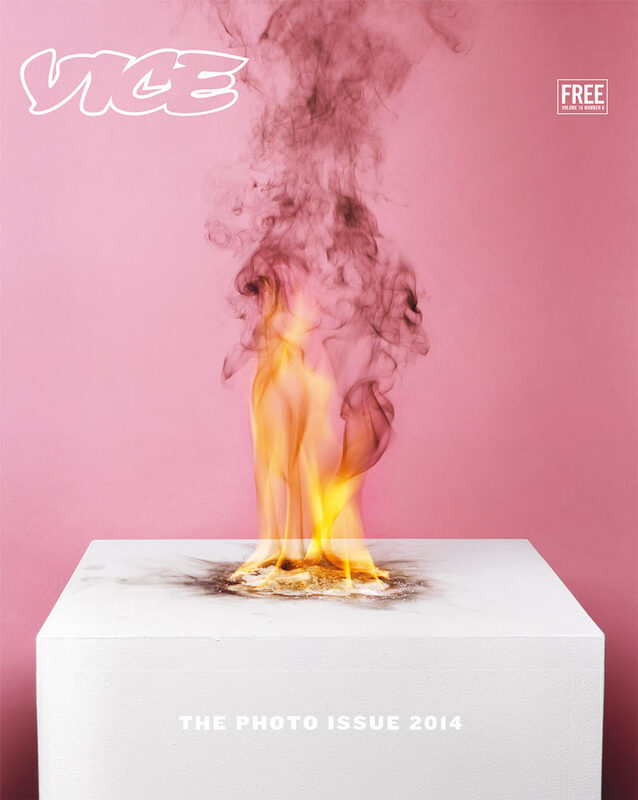 At this point, I’d like to describe my gratitude for two things: 1) that Vice was, and still remains, a free print publication producing high quality visual content and 2) an abnormally progressive Asian mother who happened upon issues of Vice among my belongings and recognized it as art. Vice specializes in the raw. The ugly as beautiful. The just plain weird. The writing was biting to say the least. It acknowledged that life was not pretty. But it was gorgeous. And deep. Portraiture that could captured so much of a person that you could see deep inside their soul. They were sumptuous not in the way of Condé Nast Traveler, but in a whole way of their own crazy invention. (Controversial Confession: I actually appreciate Terry Richardson’s style of photography.) And in doing so, they were often the first stake claim on the next big thing. Whether it was David Chang’s Momofuku, American Apparel or Kanye West. At the same time, Vice Magazine isn’t something that everyone will love. While the magazine itself has moved into the mainstream (hello CNN and HBO! ), I feel like it remains true to itself by touching on elements of life and society, especially in the rich west, that aren’t typically acknowledged. Also, it’s sense of humour? Well it’s on fleek. And more akin to everclear than a dry crisp chard. I also learned that the visual medium was a way of achieving voice. I often find it’s difficult to authentically write what I feel (after years of public health-ing it). I sound like an instructional video at best. Instead, I like to think that I capture that better in the visual sense. 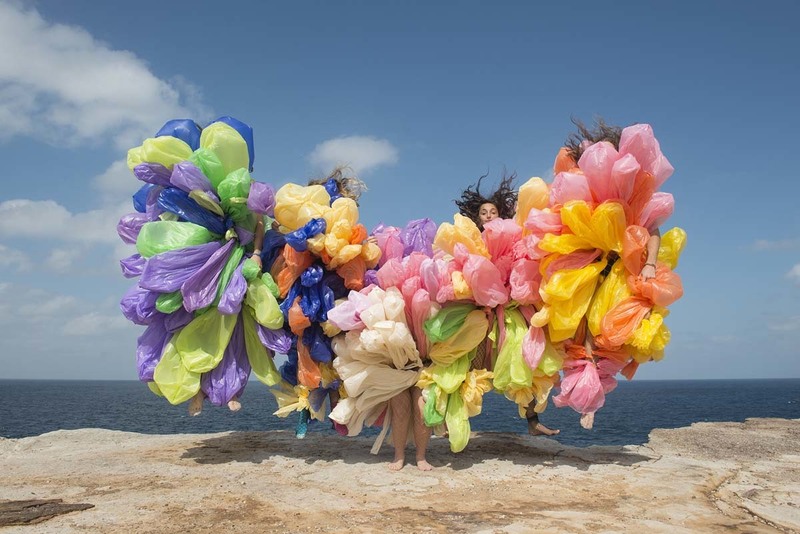 The magazine recently described twenty-one year old photog Prue Stent’s new showing as beauty that is “dreamy and gruesome.” I suppose this is what I would like to start achieving one day. I find beauty in lady muscles. And the mess of a wet market. The bipolarity of life. Heck, I live in Phnom Penh. In emerging Asia. That should be sufficient cause. So today, I wanted to share some of my favourites from Vice. 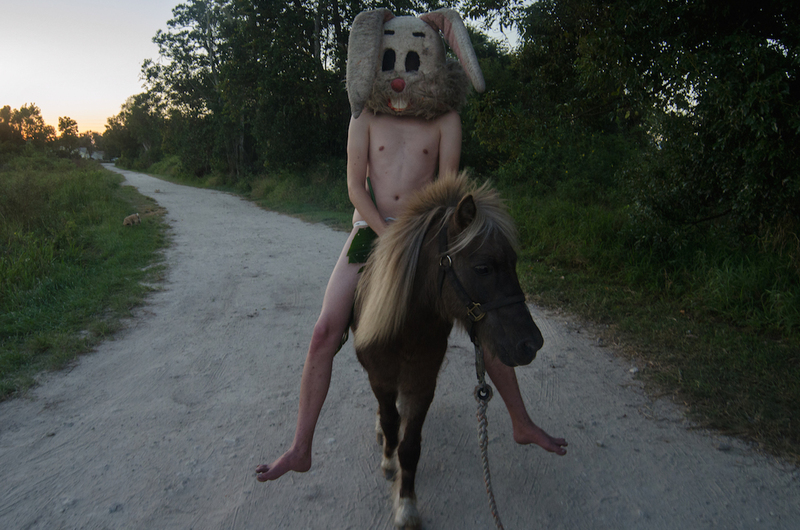 (Don’t worry – nothing too risqué here…just plain weird, though some of the links lead to NSFW content). Photo Credit: Annie Collinge featured in Vice. Categories: iconography, process, thefeels | Tags: A Beautiful Mess, developing a personal photography style, inspiration, Vice magazine | Permalink. When I was small, I was the quintessential tomboy. I liked boy things. Climbing trees, and possibly living in them. I was definitively anti-Barbie. And hostile to pink and lace. You couldn’t even talk to me about wearing a dress back then. I had only one icon. He was a boy who could fly. He fought pirates and lived in a treehouse. And then I found out that it was a girl who traditionally played the role of a live action Peter Pan. Mary Martin, flying around a 1950s soundstage and showing who’s boss, blew my seven year old mind. And with Allison Williams reprising the role of every kid’s favourite flying rebel, I realized that this little dude still has an influence on not only my personal style but perhaps has had on imprint on so many others (umm hello Catniss). So come on ladies, let’s get our swashbuckling flight mode on. PS – Christopher Walken rocking Captain Hook?!?! 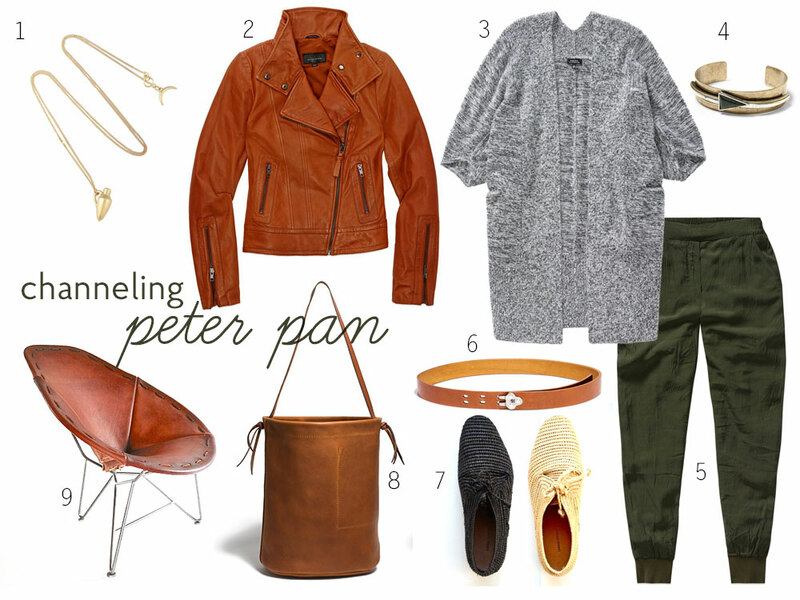 Categories: hear/see, iconography, prettyshit | Tags: Peter Pan | Permalink. Amy Poehler is one of the coolest people on the planet, that has long since been established. Adding to her laundry list of awesomeness, (including TV shows, movies, writing and the totally fantastic Amy Poehler’s Smart Girls) the lady kills it in the fashion department. Seriously, the woman can wear a dress. Or a tux. Or whatever the hell she feels like. Categories: iconography, prettyshit | Tags: iconograpy | Permalink.